Former FBI director James Comey has said Donald Trump is “morally unfit to be president” and treats women like “pieces of meat”. Hours before the interview aired, the president went on the offensive, accusing Mr Comey of “many lies”. “Our president must embody respect and adhere to the values that are at the core of this country. The most important being truth. This president is not able to do that,” Mr Comey said. After the interview aired, Mr Trump’s party – via the Republican National Committee – released a statement saying Mr Comey’s publicity tour for his new book showed “his true higher loyalty is to himself”. “The only thing worse than Comey’s history of misconduct is his willingness to say anything to sell books,” it said. 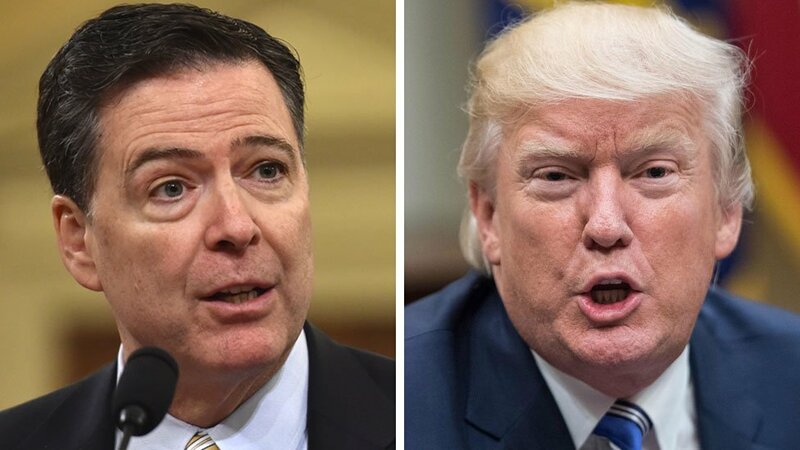 It is the latest development in a long-standing feud between the two men, further fuelled by the upcoming publication of Mr Comey’s memoir A Higher Loyalty: Truth, Lies and Leadership. President Trump has said the” badly reviewed book” raises “big questions”. He also suggested Mr Comey should be imprisoned, and in recent days began referring to him as a “slime ball”. The story dates back to the 2016 presidential election, when Mr Comey was FBI director, and the investigation into Democrat candidate Hillary Clinton’s handling of classified emails on a private server while Secretary of State. In July 2016, he said that she had been “extremely careless” in her handling of the emails, but the FBI would not press charges. However, in October, days before the vote, he sent a letter to Congress telling them the FBI was reopening an investigation after finding more emails. The letter went public – and Mrs Clinton says it handed Donald Trump the election. On 6 November, the FBI said it had completed its review into the new trove of emails and there would, again, be no charges. Once Mr Trump became president, Mr Comey says he tried to extract a pledge of personal loyalty from him – something the president fiercely denies. In March 2017, when alleged links between Mr Trump’s campaign and Russia were being investigated by the FBI, Mr Trump allegedly pressured Mr Comey to publicly declare that the president was not personally being investigated – something the then director says he declined to do. Some Democrats blamed Mr Comey for costing Mrs Clinton the election, while Trump supporters felt he was targeting the president with the Russia investigation. He was fired by President Trump in May and found out about his dismissal by watching TV news. Is there evidence of obstruction of justice? ABC News has released a full 42,000-word transcript of the interview between Mr Comey and chief anchor George Stephanopoulos. A chunk of the interview deals with the sacking of National Security Advisor Michael Flynn on 13 February 2017 for lying about contacts with the Russian ambassador. A day later, Mr Comey is sitting in the Oval Office with Mr Trump alone – the vice-president and the attorney-general have been asked to leave. The former FBI head asserts in the interview that Mr Trump tried to pressure him into dropping any investigation into Mr Flynn. Mr Comey says he let the comment pass, but concedes he should perhaps have suggested to the president that it would amount to obstruction of justice. Mr Trump strongly denies Mr Comey’s account. James Comey thinks Donald Trump is a serial liar who degrades women and is “morally unfit” to be president. He says it’s “possible” but “unlikely” that Russia has compromised the president, and that he may have obstructed the collusion investigation. He also believes the American people can’t do anything about it until the November 2020 presidential election. That’s just one of the contradictions that emerged in Mr Comey’s interview. He said he strove to make non-political decisions about the highly political 2016 investigations into Hillary Clinton and the Trump campaign. He spoke of integrity and honour, but confessed that he may not have had the “guts” to confront the president. The former director gave a complex interview reflecting a man challenged to draw meaning from his place at the centre of the biggest political stories of a lifetime. It made for gripping television. Now Trump loyalists will pick apart his remarks and return fire. “Nobody gets out alive,” Mr Comey quipped in the early days of the Clinton investigation. It wasn’t really a joke then. And it certainly isn’t now. What else did Mr Comey say? In the prime-time TV interview, Mr Comey suggested that the president had surrounded himself with people loyal to him – he compared Mr Trump to mob bosses he had investigated as a younger man. “The loyalty oaths, the boss as the dominant centre of everything, it’s all about how do you serve the boss, what’s in the boss’ interests,” he said. “I hope not because I think impeaching and removing Donald Trump from office would let the American people off the hook,” he said. Instead, he said, it was something the American people were “duty-bound to do directly” at the voting booth.